In the 19th century, many colonists felt that the Victorian environment needed to be ‘improved' to make it more like England. In 1861, the Royal Acclimatisation and Zoological Society formed in Melbourne, with the aim of introducing to Victoria plants and animals from Britain and its colonies. These well-meaning colonists had no way of knowing the disastrous impact their actions would have on the Victorian landscape. The most serious self-imposed disasters and the most stupid of the white man's interferences with the environment were the introduction of the blackberry and the rabbit. Another method used to keep rabbits from Victoria out of Western Australia was the Rabbit-proof Fence, which ran from the northern to the southern coast of Western Australia and covered over 3000 kilometres. In 1865, rabbits burrowed into graves at Point Ormond and dug up human remains and by 1870, moves were made to curb the growing rabbit population. 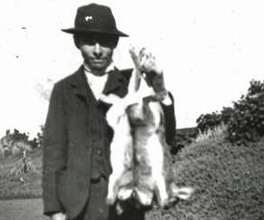 In one hunt at Colac, between 4000 and 5000 rabbits were killed in half an hour. Those that escaped continued to breed, wreaking havoc on crops and vineyards. Foxes were introduced in the hope that they would help combat the problem, but this experiment failed and foxes became a new environmental pest, preying on farm animals and native wildlife. The introduction of myxomatosis in 1950 finally made rabbits a more manageable problem, but today there are still occasional population explosions. The Acclimatisation Society also released many exotic birds in Victoria, some of which have now become pests. Common garden birds – such as sparrows and blackbirds – were introduced from England, but caused few problems. English starlings and Indian minahs, on the other hand, bred rapidly and competed with native birds for habitat. A number of species of domestic animals – such as dogs, cats, pigs and goats – either escaped or were released into the wild. Cats were particularly good at adapting to Australia's dry conditions, and large feral populations survived by hunting rabbits, native birds and animals. By the end of the 19th century, Australia was developing a sense of national identity, and people began to appreciate the unique Australian plants and animals. But by then, much of the damage had been done, and many native animals had been brought to extinction by introduced animals. Many towns throughout Victoria and Australia were ‘drowned’ to make way for dams in the early part of the twentieth century. Water management has become an important issue in our ‘sunburnt country', but its imprint on the environment can't be ignored. Erosion is a major issue for the Victorian environment, affecting the land, its people and our cultural heritage.